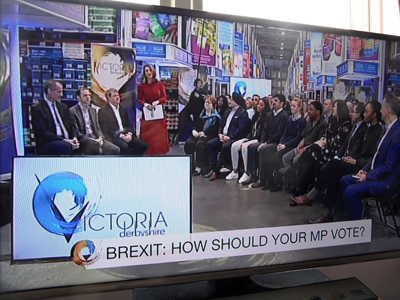 The Aston Cross, Birmingham, cash & carry of East End Foods hosted Monday’s Victoria Derbyshire BBC Television discussion on the Brexit issue. Director Jason Wouhra OBE spoke several times during the show. The audience, chosen by the BBC, would have included some of the C&C/wholesaler’s staff, but they declined because of last-minute nerves appearing in front of the TV cameras. Wouhra, one of Derbyshire’s ‘Brexit Bunch’, a group occasionally called upon by the broadcaster to air their views on the subject, later shared his feelings about Brexit with Cash & Carry Management. He said: “Personally, I feel that Parliament should pull together and support Theresa May’s proposal. Although I don’t think it’s a fully negotiated and finalised plan, we still have until 2020, and possibly beyond, to finalise details of our departure from the EU. East End Foods, a member of Unitas Wholesale, has two cash & carries: Aston Cross (120,000 sq ft) and Smethwick (100,000 sq ft). It has total staff of 400 and an annual turnover of £200 million, a figure that includes the 250,000 sq ft West Bromwich production facility.